Now we are in a dead weather period (no precipitation until Sunday), it is good time to look at the typical daily (diurnal) variations of various weather parameters. 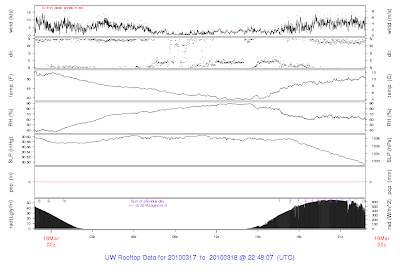 One of my favorite charts is shown above...a 24-hr plot of the surface observations at a station (in this case Seattle Tacoma Airport) for the past day (ending Thursday afternoon). Time is in UTC (aka GMT or Z time), subtract 7h to get PDT (12 UTC is 5 AM, 00 UTC is 5 PM). The top line is wind speed....sustained (black) and gusts (red). In meteorological parlance sustained winds are usually averaged over 2 minutes, with gusts defined as the highest 3 or 5 second wind during that period. Why are their gusts? Generally from the turbulent mixing of higher winds down from aloft. Notice something about the winds? They tend to be stronger during the day. Why? As discussed in an earlier post, there are several reasons, the most important being the atmosphere is less vertically stable during the day when the ground is being heated. As a result there is more mixing of higher winds from aloft. Temperature and relative humidity are mirror images of each of other. The reason? When temperature increases the air has more capacity hold water vapor. Since relative humidity is the amount of water vapor in the air divided by its capacity, increases temperature (and thus increasing capacity causes the RH to drop). What about pressure at the surface? Here is an interesting thing. If there are no weather systems over an area the surface pressure still changes! There is a typical diurnal cycle with pressure being higher at 10 AM and 10 PM and lowest at 4 AM and 4 PM. The highest high is 10 AM (+or- one hour) and the lowest low at 4 PM. Why? The biggest forcing is the diurnal tide in the stratosphere. It is like a lunar tide in the ocean (two highs and two lows), but instead of being forced by gravity, it is the heating of the stratosphere that does the forcing. You can see the solar radiation at the bottom. It looks like a cosine function (for those of you who remember your trig), with the few imperfections in the shape due to clouds. Finally, the second strip of observations is wind direction. Not how it flops around when the winds are light. In fact, you really can't believe wind direction for most wind vanes until the winds get above roughly 2-3 knots. The information gathered by the questionnaire will help guide more effective techniques for communicating important weather and flood information. The following link connects to the survey. Thanks for considering this.